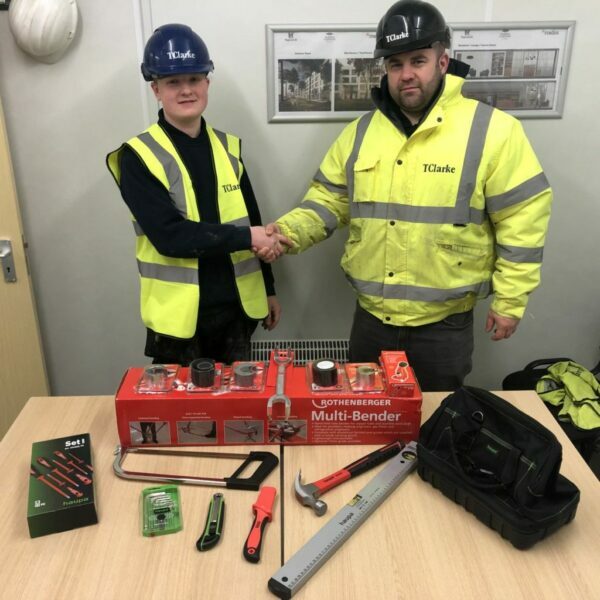 The Smith Brothers Stores branch in Bristol have recently supported Taylor Darby, a first-year mechanical apprentice working at TClarke’s, supporting him with Rothenberger tools. SBS Bristol were pleased to assist an apprentice to enter the mechanical sector of construction and encourage businesses to employ more. This well-known company started in 1889 (8 years before Smith Brothers) founded by Tommy Clarke. In the following 130 years the business has retained a reputation for quality, staying independent throughout that time. The company is well known in the construction industry providing integrated services which include; infrastructure, M&E contracting, residential & accommodation, technologies and facilities management. The company boast how they are one of the best apprenticeship providers in the construction and engineering industry. TClarke aims to keep improving as a business to ensure help for young people to get the most from their careers. The business deliberately sets the bar high to maintain standards, offering apprentices highly skilled mentors who have passed their own apprenticeship and have great knowledge within the industry. Apprenticeships can allow a business to grow and solve recruitment challenges. It also encourages creativity and enthusiasm through employing new candidates or upskilling current staff members. The training is often tailored around the needs of the company, meaning the learning can be bespoke and conducted within the workplace. Are Smith Brothers hiring Apprentices? Simple answer, yes!! Since the drive from the government and the introduction of the apprenticeship levy fund, the business has either upskilled existing staff or taken on multiple apprentices within the last year. With the company work force now exceeding 300 individuals and rising, utilising apprentice levy is a great tool to help the company progress and improve. A couple of examples of courses being studied include supply chain warehouse operative and digital marketing. This showcases the range and scope of development available and reinforces our commitment to investing in people, which is one of the key areas of success for Smith Brothers.